Chives: This post should actually have been for Maroi Bori Thongba. Manipurians make the curry with maroi nakuppi or the chives used as a substitute for onion and garlic. Vidya first suggested chives as one of the secret ingredients, but after an extensive search in the gourmet stores and local veggie shops, I was not able to lay my hands on fresh chives. I had to therefore, request a change in secret ingredients. 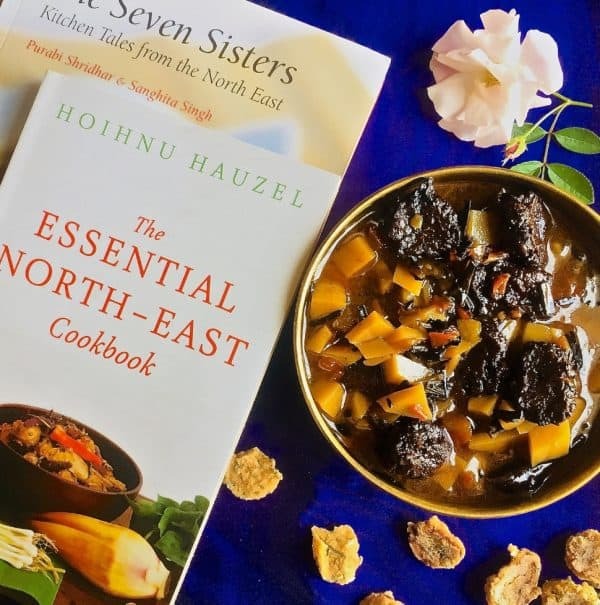 The recipe I have followed for the Bori Thongba, is from the cookbook, The Seven Sisters – Kitchen Tales from the North East, by Purabi Shridhar and Sanghita Singh. The book credits this Manipuri variant of the popular Aloo Badi, to Bidya Rani. Out of necessity, I have taken some liberties with the recipe for Aloo Badi. I have substituted spring onions for chives, and plain lemon peel for heiribob or the peel of the Manipuri citrus, Khasi papeda. Nor could I find a more suitable substitute such as Kaffir lime. Other than these, I have stayed close to the original recipe in terms of ingredients and proportions. 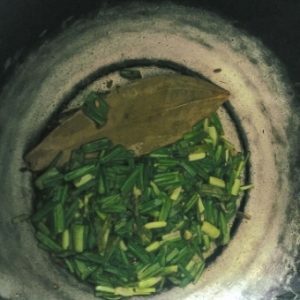 Traditionally, Maroi Bori Thongba is prepared using a large quantity of chopped chives. 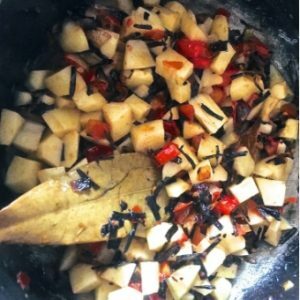 The ingredients vary from maroi and badi or maroi with peanuts, maroi potatoes and thangjing (makhana or lotus seed or foxnut) or even just maroi with thangjing, or maroi aloo badi. You may also make it from other combinations of these ingredients. If you browse through my posts for the last year or two, you will know about this FB Group. Every month the admin partners each of us with another member. We exchange the names of two ingredients to fit the current theme, and cook using those ingredients. 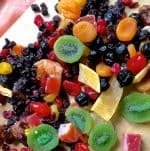 We post the image of our dish on the group, and the other members try to guess the two secret ingredients. This month, my partner is Vidya Narayan who blogs at Masala Chilli. As the name indicates, she likes spicy food and the pungent heat of the chilli. She is also serious about healthy nutritious food. You will therefore find recipes on her site, using a variety of grains and flours and low calorie recipes suitable for diabetics. There are a number of recipes from international cuisine too. 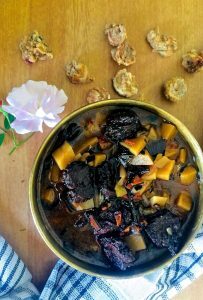 Some recipes which caught my eye, were the Air Fryer Purple Yam Chips and the Sugar Free Dates, Rose and Pistachio Ladoos. Do visit her blog and see the posts for yourself. 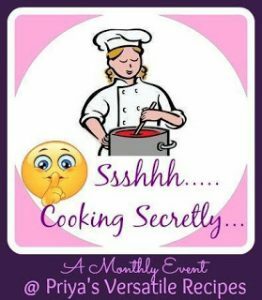 This post is sent to the event Ssshhh Cooking Secretly Challenge, Theme Manipur Cuisine. Heat a pan and add the mustard oil. Wait till it is hot (about 45 seconds) without letting it smoke. Add the badi, and fry on low heat till it is a light brown. About 2 minutes. 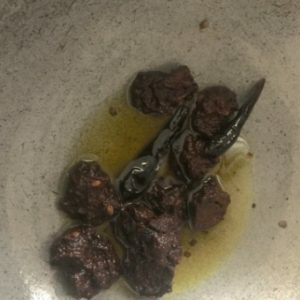 Add the whole dried red chillies to the badi, fry them till they begin to turn black (turn them so that both sides are fried). About 45 seconds Strain the badi and chilli and set them aside in a dry bowl, till required. In the same pan, or after transferring the left over oil to a larger pan, start making the aloo badi. If there is very little oil in the pan, add another 2 teaspoons. Add the jeera and let it crackle. Add hing powder (asafoetida), the bay leaves and sliced chives. Keeping the heat low, saute till the chives begin to blacken. About 5 minutes as the chives may take some time to blacken. Increase the heat and add onion slices. Saute till the onions darken to a golden brown. About 2 minutes. Add the ginger garlic paste, stir them in. Saute for about 30 seconds, till you get the aroma of the ginger and garlic. Add tomatoes, and still keeping the heat high, stir continuously for about 30 seconds, till the tomatoes blend with the rest of the gravy. Now drain and add the potatoes, stirring so that they are coated in the masala. About 10 seconds. Add the fried badi and red chilli, along with any residual oil. Add the citrus peel, stir well. Add the garam masala and salt and again stir well. Add 2-3 cups of water so that the surface of the curry is completely covered. Bring it to a boil and then reduce the heat, to keep the curry in a simmer for about 20 minutes. The badi/ nuggets should now be soft and spongy and the potatoes should be cooked. Remove to a serving bowl. Serve hot, with steamed rice. Thank you, Sasmita. I have some stock of badi left and I hope to try the recipe out once more with authentic ingredients such as chives, for which I had to substitute spring onions this time. Wow I did not knew this dish existed in manipuri cuisine. 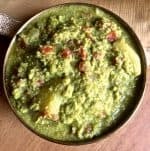 We too make a Badi curry and it is interesting to see how we have similar versions of the recipe with variations. This looks interesting and delicious. Thank you Renu. I have read about Manipur cuisine for the first time, and liked it a lot. 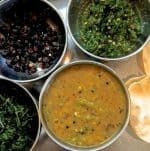 Would love to know more about the badi curry that your make! I have never made any dish with dumplings till now. 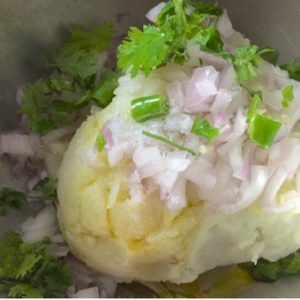 This aloo badi recipe is very well explained and I would definitely give it a try. 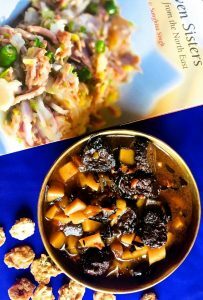 Thank you, Anu.This summer I plan to make a variety of badis, so that I can use them the rest of the year in these interesting regional recipes. It is so difficult to source some of the traditional and authentic ingredients all over India of some of the states. 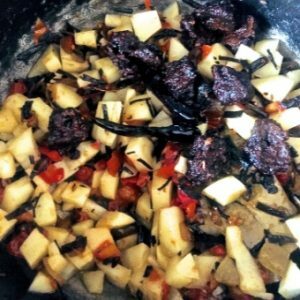 Your aloo badi Manipuri Bori is surely a dish that I would like to try out, and like your suggestions of some of the ingredients. This makes it a doable dish. The Badi and the potatoes certainly make the curry look delicious. Best eaten with steamed rice, this is a flavourful combination now I need to explore soon. The book sounds amazing and I hope to get a copy soon. North Eastern flavours are super healthy, atleast with the Manipuri cuisine I have really felt so. 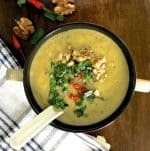 Subtle spices, aromatics, broth – All a great way to bring out flavours. Thank you Vidya. 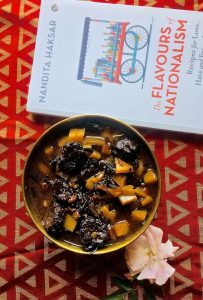 It has been fun trying out North Eastern recipes, as I have not made or even had any of them in all these years. I now yearn for a trip to the North east to experience the culture and food for myself. Wow, such easy recipe and it looks yummy. I simply loved the curry colour. Thank you Pavani! 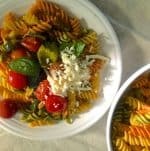 I was happy at the way the dish finally turned out, and it did taste extraordinary good! Such a simple recipe on the face of it but such depth of flavour. You have found great substitutes that can be found easily in my part of the country. Thank you Aruna! The challenge in cooking these traditional recipes and getting them as near the original as possible, is of course the ingredients! Bodi thongba sounds mouthwatering. I love badi in my no onion garlic dishes. But you have used garlic in it. I will try it soon I am sure its taste great. This looks lip smacking delicious…i can enjoy a bowl of hot rice with this curry .. Thank you, Lathiya, thats how I tasted the curry too! 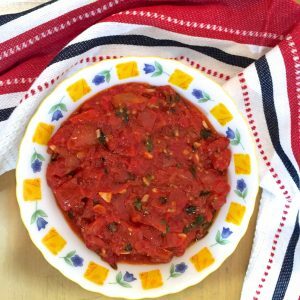 Its easy to prepare and the badi makes such a difference to the taste and texture! In many parts of Maharashtra, badi making has already started for this year. That said, this nugget curry of yours is perfectly timed di . The curry looks filling and comforting with a simple to follow recipe. Would love to give it a try sometime soon. Bookmarked it. Thanks for the share. Thank you so much, Poonam! Well the heat has started making itself felt here too, and this time Im not going to miss a single day of sunlight for making badi and sun-dried tomatoes! This recipe is very new to me.. Sounds interesting and well explained. Thanks so much, Priya. North Eastern cuisine is quite unfamiliar to me too, but now I want to visit and understand it better! Thank you, Priya! Once the climate changes, which should be any week now, I plan to make a host of different badis! And try them out in various recipes too.